Mega Walk in Drive for Graduates @ Madurai: For PHP, CSS, Business Development Executive, Business Analyst, iOS, Android, System Admin, Business Process Manager, Customer Support Manager, IT Sales Manager and Customer Support Executive. Be a part of our Growing team. Get a head start on your career with Cogzidel Technologies. Explore an Exciting career with a young and dynamic IT Company. We are growing and looking for the next generation of winners like you. 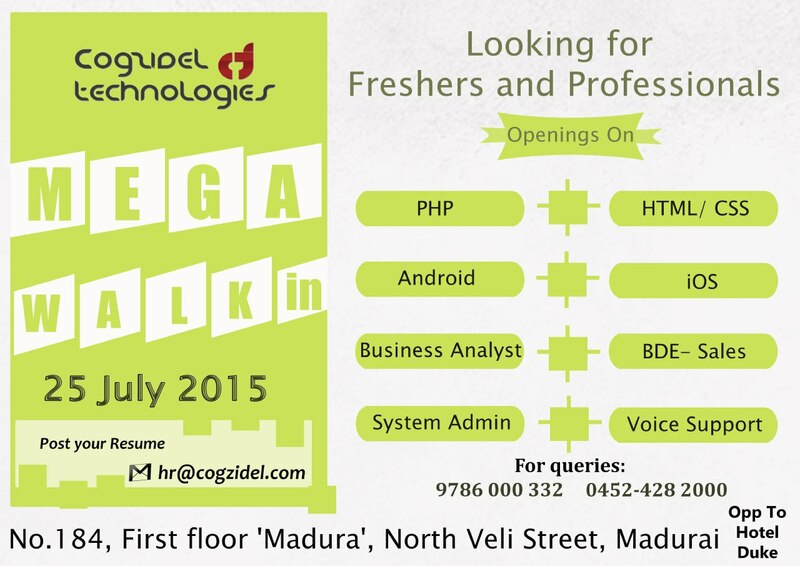 Cogzidel Technologies announce a walk-in for the Freshers / Experienced at the below mentioned venue. Walk-in to find your dream job! LandMark: Simmakal Sethupathi High School Bus Stop. Contact Person: Dinesh Kumar.R.J./ SuryaNarayanan.R.P. Skills required: Strong knowledge in Core PHP. Exposure to Oracle, MySQL is preferable. Qualification: Any UG / PG degree. Skills Required: Project Development, PHP, MYSQL, Codeigniter Framework, CMS, js, jquery, ajax and Team Leading skills. Experience: 2+ Years Experience in working with PHP. Skills required: Strong knowledge in HTML 5, CSS 3. Basic Knowledge in js, jquery. Skills required: Excellent written and oral communication, social media maven, excellent sales and negotiation skills. Qualification: Any degree, M.B.A (Marketing) preferable. Skills required: Excellent Oral and Written Communication. Good Analytical skills and problem solving ability. Documentation and Specification Skills. Exposure to typing skill is preferable. Skills required: Strong knowledge in Objective C,Swift language. Skills required: Strong knowledge in Java. Basic knowledge in MySQL. Skills required: Strong knowledge in Linux and Windows. Basic knowledge in Networking. Qualification: Any UG / PG degree. Red Hat certified candidates are Preferable. Skills required: Manages complex systems process analysis, design, and simulation. Anticipates and plans for process integration opportunities that support business objectives. Qualification: Any UG / PG degree. MBA (preferable). Experience: 5+ years Experience in Customer Support / BPO. Skills required: Excellent written and oral communication. Excellent sales and negotiation skills, good business sense. Good planning and organizational skills. Developing effective sales plans using sales methodology. Responsible for managing the sales team and meeting agreed targets. Experience: 5+ years Experience in Sales / BPO. Skills required: As a Customer Support Executive, He/she should have 2+ years of experience in BPO maintaining Customer support.Should have excellent communication skills in English both in written and oral communication. Experience: 2+ years Experience in Sales / BPO. Next Entry Get DropInn Premium Upgrade + DropInn Mobile For Just $1199!